Slowly but surely, Alfa Romeo is knocking its Giulietta into pretty good shape. The experts at Car & Driving look at the latest restyled version. Alfa Romeo's Giulietta premium compact hatch gets further improvements highlighted by a frontal restyle that brings its look into line with the brand's desirable Giulia model. There's a smarter interior too, plus a plusher interior, greater connectivity and the option of a hi-tech TCT auto gearbox with the 120bhp 1.6 JTDM-2 desel engine that many UK buyers will want. Time, perhaps, to give this car another look. Even now, we can't quite decide whether the Alfa Romeo Giulietta is a good-looking car or not. It's extremely colour and trim sensitive. Have a little play on Alfa's online configurator and just by making some small changes to wheels and paint finishes, you can rapidly turn a stunner into something rather less attractive. This latest model gets sleeker front-end styling that includes a striking honeycomb grille, piano black bumper inserts with red highlights on sporty models and revised headlamp and fog lamp surrounds. The idea is to emphasise the Giulietta's close genetic links with Alfa Romeo's premium segment Giulia sports saloon: hence the smarter badging, classier alloy wheels, revised tail pipes and fresh new colours. Inside, there are revised seat upholsteries, dashboard and door panel finishes. Plus a Uconnect infotainment system now with smartphone-enabled LIVE services. These include music streaming with access to the Deezer and TuneIn set-ups, news with Reuters, Facebook Check-In and Twitter. Plus Alfa's useful 'eco:Drive' and 'my:Car' services, along with traffic updates for navigation-equipped models. Otherwise, it's pretty much as you were. Those sleek lines don't impinge on practicality too much, although there's not as much space in the rear as the exterior dimensions might suggest. The 350-litre boot is competitive and Alfa has built a range of storage options into the cabin. The controls are arranged in tiers on the sweeping dash and there's a suitably traditional set of cowled instruments. As before, prices range in the £18,500 to £28,500 bracket and in the mainstream range, there's a choice of 'Giulietta', 'Giulietta Super', 'Giulietta Tecnica', 'Giulietta Speciale' and 'Giulietta Veloce' trim levels. The entry-level Giulietta benefits from burnished headlamp surrounds, satin-finish door handles and smarter tailpipes, while inside there are classier grey and black fabric seats with an Alfa Romeo logo on the head restraints, along with a smart matte black dashboard insert and luxury floor mats. The refreshed style elements are accompanied by a standard equipment list which includes a leather steering wheel with audio remote controls, air conditioning, a five-inch Uconnect LIVE infotainment screen with Bluetooth connectivity, the Alfa DNA driving mode selector, six airbags, 16-inch 'Turbine' alloy wheels, one-touch electric windows all round and steering-wheel paddle shifters on TCT-equipped models. Alfa hasn't skimped on safety features and the Giulietta gets a complement of six airbags plus an array of electronic devices designed to let drivers extract the maximum from their car while staying safe at all times. There's ABS anti-lock braking with Electronic Brake force Distribution (EBD); Vehicle Dynamic Control (VDC) - Alfa Romeo's interpretation of Electronic Stability Programme; Cornering Brake Control (CBC), Dynamic Steering Torque (DST), Hydraulic Brake Assistance (HBA) and a Pre-Fill function for the brakes. 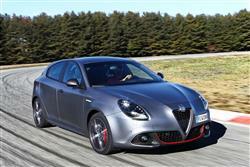 This helped the Giulietta achieve a record 87 out of 100 score on the revised EuroNCAP ratings.